Draw a rectangle, in data coordinates. Places a rectangle on the plot, by specifying the X and Y location of the lower-left corner, along with width and height. 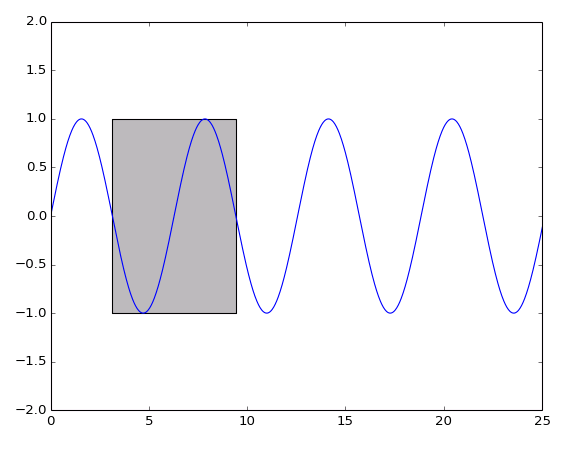 This VI may also be used with polar plots, in which case the “rectangle” is a wedge. X position of the lower-left corner of the rectangle. Y position of the lower-left corner of the rectangle. Fill color for the rectangle. Defaults to light-grey. Controls the appearance of the rectangle edge. Controls general appearance of the rectangle. Download Shapes.vi, or see Examples for a complete list of examples. This VI supports both polar and rectanguar axes, as well as linear and log scales. However, use with symlog scales is not currently supported, and will result in error 402906 - Operation Not Supported for Axis Scale. If X Position or Y Position is non-finite, no rectangle is drawn. If Width or Height is non-finite or zero, no rectangle is drawn. Negative heights and widths are permitted.